Do you plan on taking an active role in your kids’ health and well-being, or will you leave that completely up to your Pediatrician? Recently I took a moment to sit down with a very successful, charming and intelligent Pediatrician (okay, my wife) to ask her what issues she would like new parents to take ownership of when it comes to their kids’ health. According to a study published in Pediatrics, children who drank at least one sugary drink per day were 43 percent more likely to become obese than children who drank less on average or none at all. “Juice is just like soda,” says pediatric obesity specialist Robert Lustig. “There is no difference.” Juice is full of sugar, it’s high in calories and it’s dangerous. Normal fevers between 100° and 104° F (37.8° – 40° C) are actually good for sick children. They turn on the body’s immune system and help it to fight infection. Unless your child is experiencing an extremely high temperature over 104, you don’t need to panic or go to the ER or call your Pediatrician. Instead, treat with liquids, rest and Children’s Tylenol or Motrin. According to a study in the Journal of Developmental and Behavioral Pediatrics, “The longer children co-slept, the worse their sleep habits—including shorter sleep duration and frequent awakenings.” This isn’t to say that if you let them co-sleep, your kids are guaranteed to have sleep issues. But the odds are against you. New parents need to make a decision on this early on, and they believe the science, commit to not co-sleeping. It may not be easy at first, but your family will benefit in the long run. The debate over vaccinating children stems from an article published in 1988 linking the MMR vaccine to autism. However, that article has since been discredited and retracted by the journal that published it. Read what the Center for Disease Control has to say on the issue here. Or what the World Health Organization says here. Or this interesting anecdotal evidence, from a woman who grew up unvaccinated and contracted many of the diseases vaccines could have prevented, such as whooping cough, polio, measles, Haemophilus influenzae, and rubella. The fact is, vaccines are safe, they save lives and your child should have all of them according to the recommended schedule. If you’re a father who is a primary caregiver, or equally and actively involved in your family’s child-rearing, you are probably up to speed on the finer details of your kids’ health history. However, many fathers who bring their children to the yearly check up simply don’t have all the necessary personal information about their kids that the doctor needs. “When was your child’s last physical?” “Any rashes?” “Any problems at school?” If you can’t answer these questions, it can create complications for the physician and slow down the well visit. It’s important that whichever parent takes the child to the doctor — mom or dad — be well versed in that child’s health and well being, so make sure you have this information at the ready. Taking antibiotics will not cure the infection, will not keep other people from getting sick, will not help your child feel better, may cause harmful side effects and may contribute to antibiotic resistance. The fact is, when it comes to a viral infection, you have to ‘let it run its course’ and simply treat the symptoms until the virus is gone. And this isn’t an income-class issue. According to the National Survey of Children’s Health, only 33% of children in poverty are read to every day, and in family incomes four times greater than the poverty level, 40% of children do not get a daily dose of reading. Reading to your kids is one of the simplest things you can do that will have lasting, long-term health benefits for children. Years ago, our parents and grandparents seemed to understand this intuitively: if the doctor is late, it’s for a good reason. If your pediatrician is running an hour late, consider the possibility that they’ve been in the room with an obese 13 year old girl who is being bullied at school and having suicidal thoughts, or something similarly intense that requires extra time and consideration. Plan out your day by allotting a few hours for the visit in case the Pediatrician can’t see you exactly on time, even if they want to. And bear in mind, when it’s your turn, your child will get the same level of care and attention. Just like fevers, most of the time you don’t need to call your Pediatrician for medical advice when your child has a rash. If your child is not febrile, not itching, and generally not bothered, give it some time. Only use fragrance free, dye free products and moisturize. Apply some Vaseline or Eucerin or Aquaphor, cover it up, and wait. If you don’t see improvement after a few days, then it would be appropriate to call your Pediatrician. If you’re not convinced, do a test run: take the TV out of their bedroom and track the results over the course of a few weeks. You might be surprised. Pediatricians are in the unique position of having to work through 3rd parties (parents) in order to provide health care for their patients (children). You can make their job easier and your kids healthier by following some of the tips above, such as: eliminating juice, not co-sleeping, reading aloud with your kids daily and removing TVs from their bedrooms. Although you should rely on your Pediatrician to provide general medical guidance and prescribe medication when necessary, ultimately, you are the one who is responsible for your child’s health and well-being. Husband and father of two who works as a professional writer, having sold screenplays to Sony, Disney, MGM and Showtime among others. Always on the look out for solid, useful information to share with other parents on Chilldad.com. Most of the article is pretty good… the point about vaccinations is short-sighted… people do not base their decision on an old study, many don’t even know about the old study… They are concerned about ingredients that the CDC admits are in the vaccinations on their website. They base their concern on actually knowing children who have been vaccine-injured and the enormous rate of children having autism, severe allergies, and learning problems… They base it on the fact that doctors are often not honest in dealing with them about vaccinations. It is too broad to say that all children should have all vaccines at the scheduled time. It is also silly to say that children will die if you don’t vaccinate them…. You know very well that not all children will automatically die if they are not vaccinated…. there is risk both ways…. Logic would say that SOME children might not benefit as much from vaccination as much as other children…. at least then, some truth would be inching in…. I can’t say that all vaccinations are all bad, but I would never say that they are all good, and as long as the medical profession tries to say that they are all good, people will not trust them. When a doctor can say, “Let’s be careful about how we approach this….” and is at least open to dialogue, then I can actually consider vaccination. If a doctor wants to increase awareness of vaccination, he first has to read what parents are reading on the internet and go through, step by step, in a logical way in showing why a vaccine is safe… Honestly, most doctors do not know how to explain this or they don’t care to…. it is easier to scare with anecdotal stories, which, btw, is the same tactic by anti-vax people….Fear is never a good basis for making a decision. Dialogue is the only way to work through it…. dismissing the problems is causing MORE problems. Sorry, the co-sleep suggestion is effed because the journal article cited has obviously not taken a broader cultural view of sleep and sleep norms. If it had, it would recognize that the American/western view of sleep — 8 hours of uninterrupted sleep under covers with no animals in the dark — is a cultural and historical anomaly. That means that any disruption caused by co-sleeping can’t be measured by that 8-hour-uninterrupted standard because it’s not a biological norm; it’s cultural. If you want to slag co-sleeping, say it’s incompatible with our sleep schedules and definitions of good sleep in our culture. Don’t say it’s bad in absolute terms. The fact is, I see families in Sleep Clinic over and over who have coslept and, years, later, are struggling to get their child to sleep through the night. It may work for some families but it does not for many others. As to the ethnographic reasons for cosleeping– we live in a society very different from thousands of years ago. I’m with you. Most people TODAY in countries everywhere sleep with their babies. And they’re not just goat farmers that have no choice like some people seem to believe. I come from an indian family, and we all coslept growing up. Most people on that side of the planet cosleep. Guess how many of us are doctors, engineers and other demanding careers? 🙂 We need our sleep. And we know how to do it from thousands of years of doing it historically. I wouldn’t be surprised if a western family doesn’t know how to cosleep effectively… it’s not what they’re used to. My parents and I coslept and it lead to both me and my brother sleeping more effectively and my PARENTS sleeping much more effectively during the rougher months. I have an enormous family with countless kiddos and they all cosleep. It’s not a biggie. We all got our own beds when we became toddlers. It depends on the family, the person, and the sleep history outside of the influence of co-sleeping….but cosleeping is definitely a viable option, not the worse option. Couple of things. First about antibiotics. You said they don’t cure most sinus and eat infections. I think that might be misleading. While antibiotics don’t cure virus infections they will cure bacterial infections which are the primary cause of sinus and ear infections. However, most mild cases of these infections will clear up on their own and antibiotics aren’t needed because it will make kids resistant. According to two of my children’s pediatricians. The way it is written can give a first time parent who is still learning the ropes the false idea that they do not need to take their child to the dr. for infections. Same with the fever, while a fever is a sign that the immune system is working, just because 103 is normal, doesn’t mean we shouldn’t have it checked out. It could be serious and ignoring it because it will likely go away could cause serious harm. I was told by my son’s first pediatrician that if it’s above 101 or causes the child to be lethargic or behave differently if below 101 to come in. It may just be a cold or it could be pneumonia. Secondly, as for wait times. Keep in mind parents that the 5 minutes you are late throws the dr off their schedule by 5 min and after 12 patients being 5 min late, the dr is now behind an hour. Things happen, I know so if you’re going to be late call ahead. I’m sure the office would be willing to the next person in line early and give you their time slot. I find that I am fortunate. My son’s psychiatrist runs on time everyday and has you reschedule if you are late. I love it and yes, I’ve been rescheduled. I’m not late anymore. Their pediatricians office is pretty much on time too. Never had to wait longer than 30 min in the waiting room, on a busy day and I am usually out within an hour to hour and half. Don’t know how they manage when no one else can, but they do and I always get their full attention and never feel rushed. My sister in laws have waited up to 4 hrs in the waiting room for their pediatrician. Lastly, to the author and any doctors here. If you have a list of things you want to tell your patients, tell them. There is no need to let your patients/parents be ignorant. One of the reasons I love my pediatricians is because they educate me about my children’s health and in return I don’t waste their time diagnosing a cold. Not true… most ear and sinus infections are NOT caused by bacteria. The vast majority are viruses and do not need antibiotics. Fevers rarely need to be seen by a doctor unless there is another coexisting symptom (lethargy, decreased urine output, no tears, abdominal pain, rash, etc). There is a lot of whining in response to this blog. Two comments. First, it’s a blog, which means he can write whatever he wants and you have the right not to read it. Second, the title implies that the only people who are truly justified in disagreeing with these points are Paediatricians. You were all clearly interested in finding out what frustrates Paediatricians so why get so mad at the author? Don’t shoot the messenger! (I agree the gif should go). You’re a stronger ‘man’ than I. (Guess that’s why I don’t have a blog, I’d lose all my waking hours getting wound up). I agree that many issues in parenting, mostly fueled by interactions on social media, are trigger topics. The difference here is that your sources are more robust than most, though largely ignored by many commentors (a minority, I agree) who prefer to continue the spread of anecdotal ‘evidence’ and personal opinion as fact. I didn’t go in to Paediatrics because I couldn’t stand the parents (I prefer looking after grumpy old men with crappy hearts). Give your wife a high five from me for putting up with people like me (pretty sure there must be science to back up that having a sick small person makes you lose a few rational neurons). She sends a high-five right back at ya. Comments are great, imo. I’ve been a professional writer for 20 years and have gotten endless notes from Hollywood executives so my skin is sufficiently thick. Appreciate your words, and look forward to being treated by someone as affable as you when I become a grumpy old man with a crappy heart! Saying that 100% juice can be very good for you. The problem Neil is the recommended servings of 100% juice: 4-6oz for children up to 6, and 8-12oz children over. The childhood obesity epidemic is due to Americans blowing past recommended servings in all areas. Approximately 35 percent of children between the ages of 1 and 6 consume 2 CUPS of juice or more per day, which is well above what is recommended for this age group, according to a June 2012 article published in “Diabetes Forecast.” We have a juice problem in this country and Pediatricians want parents to understand that. 100% juice may be the lesser of two evils, but it is still part of the problem due to overconsumption. Michael – as a mom of 3 RAISED kids (26, 24 and 20) and they are all doing well in life, I agree wholeheartedly with all of your advice. Did I break most of those rules while raising them? Yep. I think the advice is common sense and I’m just not sure why the comments posted here are so adversarial. Chill people. There are always exceptions to every rule, these points are mostly to establish a baseline. Kids shouldn’t have a TV in their bedroom. Yours do, sounds like they are doing fine, so what is there to say? This advice is meant to establish the baseline for parents who have questions. There are doubtless millions who buck this advice and kids turn out great, happy and healthy, like yours. In response to #1, what about low sodium V8? My daughter loves that stuff. re: low sodium V8 – Better than juice, but not recommended over water. This article is one persons deluted idea of what parenting should be!!!!! Absolute Crap! Do not agree with most things on this list! sp. deluded. Thanks for the feedback. It is a lot easier to be patient with doctors when they don’t charge to fill out forms, don’t bill you if you don’t call to cancel 24 hours in advance and don’t work in buildings that charge $20 for parking. Agree. Wife’s practice doesn’t charge for missed appointments. Consider finding physician who doesn’t? #5 just sits wrong. I am sure the pediatricians report it as such, but I am guessing there is a larger percentage of SAHM in their sampling than SAHD. I would guess in families with SAH-parent, that parent is best versed in what is going on with the details of the kids. Its kind of their job, when they are the SAH-parent. I suspect the disparity between moms and dads who both work full time would be less. It would be an interesting study for someone to do. I got to this page because my wife sent me a link, this is what is wrong with the internet. All these points you make, none are sourced, it’s just irresponsible to say stuff and the only thing you have to back it up is you talked to your wife…really? I wish there was a more reputable source on the internet when it comes to the topic of our kids health. Maybe like an institution dedicated to advancing medicine without the hearsay of misinformed minds. Oh… how about the Mayo clinic. seriously people, your children deserve better than getting advice off a blog. Points 1, 2, 3, 4, 6, 7 & 10 are sourced. As far as juice – From Mayo Clinic website — “Beverages: Stick to water and unflavored milk (most of the time).” http://www.mayoclinic.org/healthy-living/nutrition-and-healthy-eating/expert-blog/kids-and-sugar/bgp-20056149. You are correct, I was rather rash in my commenting, I had a chance to look through more of your website and it is full of useful advice and it’s very well curated. I can see why my wife has it bookmarked. Color me surprised that many of the things I was curious about (funding college education and educating my kids on good music) you discuss in great detail. I am a fan and thank you for putting out such a good resource, I will definitely be back. This…this post is why we go to a family doctor who does OB and who strives to balance himself instead of a pediatrician. Our doctor respects us, offers his very knowledgeable advice and recommendations and let’s us then make educated decisions about our health and our kids. The key is that we are responsible and he provides the tools to make those decisions. Just as a point on vaccinations, they do have inserts that advise about possible side affects like any drug or medication. They are not 100% safe. They have risks which should not be ignored. We are not opposed to vaccination. We have had a child violently react to a vaccination, but we understand that is not always the case. Offer a parent good, non-fear based information to make good decisions, whatever that means for each family. While a lot of these are good, I had to disagree wholeheartedly with discouraging co-sleeping. I feel like it is more of a cultural decision – not a health decision. There is nothing inherently unhealthy about co-sleeping and it seems when people discourage it, it’s usually fear-based, or poorly researched, or based on a cultural bias rather than proof. Nothing wrong with co-sleeping not being someone’s cup of tea, but there is also nothing wrong WITH co-sleeping for families all over the entire world who co-sleep and have lower infant mortality rates than we have in the U.S.
On number 9, I agree with the general premise… but also found some pediatricians to be extreme pains in not paying attention to skin issues. At our daughter’s 4 month checkup, my wife brought our 2.5 year old son with who had a couple of sores on the back of his leg that weren’t healing. We weren’t looking for a diagnosis, but she just wanted to ask if the doctor thought we should make an appointment for our son to have it examined. The doctor looked at it for 2 seconds and said it was molluscum, a generally harmless but annoying skin condition. Two days later he sprung bumps up over much of his arms and legs (which would not be uncommon with molluscum), and the sores started looking worse (which doesn’t really make sense with molluscum). We made an appointment with a pediatric dermatologist to see if they could suggest anything to help with the molluscum because it seemed to be getting pretty bad, but that takes a couple of weeks to be seen with a new patient. In the interim, everything kept getting worse. We called the pediatrician 4 times over that span. Each time, they refused to make an appointment, saying it was just molluscum, they don’t make appointments relating to previously diagnosed molluscum. Less than 24 hours before his appointment with the dermatologist, he sprung out in a full body rash. The dermatologist determined in about 3 seconds that it was not molluscum. It was staph, and the full body rash was some either secondary viral infection or an allergic reaction that likely sprung up so badly because of the staph. Thankfully it wasn’t MRSA and the staph went away fairly quickly, but the rash left scars on his arms and knees (we’re not sure if those will go away on their own or not), and, less than a month later, he sprung up another full body rash. Now, there’s of course the possibility that the second rash was something wholly unrelated, but it’s also very possible the staph triggered an immune reaction. We’ve switched pediatricians in response, and, have concerns about the long term ramifications (is the scarring permanent? Is this a skin issue he’s going to now spend his whole life dealing with?) significant enough that we aren’t ruling out contacting an attorney. So while I agree, if your kid develops a mild rash, doesn’t have a history of skin issues, or has skin issues that are generally mild, you’re well aware of and resolve quickly without intervention, no need to call a doctor. But a doctor’s office ignoring multiple pleas to come in has made my wife and I hyperobservant and, quite honestly, giant pains in the rear on rash issues at least in the short to mid-term. As a Health Care Professional I have no problem even with waiting to see the doctor comment. I do have a huge issue with pushing vaccines on parents! Everyone knows darn well that if pharmaceutical companies didn’t run this “free” country then vaccines would not be shoved down our throats. Why don’t other countries push for vaccines? In fact some ban certain ones. I know a research scientist physician friend of ours that makes immunizations but tells everyone not to get them and he refused to have his kids get them. They are grown and very health physicians today. The only reason he does his job is because he gets paid over $150 per hour. Yes, that was $150 per hour by drug companies. Also, why are things such as cosmetics run through the testing mill to make sure they are safe but there are no true extensive testing vaccines? Again, other countries have done tests and, surprise, they won’t allow vaccines to be mandatory or they ban them. Lastly, why are there more well respected physicians like the neurosurgeon at John Hopkins now speaking up about his research of increased neurological complications among people getting immunizations? He says that the fillers being used, ever since the push of immunitaions back in 80’s and 90’s, are now showing signs of neurological problems. I could go on but this is a start. i find it ignorant of your friend to make the vaccines if he has such bad things to say about them. If he thinks they are so horrible then being greedy for the money is just as terrible. Absolutely agree! I could see the reasoning behind every point except the insistence on vaccines. A better piece of advice would be to fully research them yourself, as a parent, know the risks and benefits, and make a wise decision with the respectful help (not the condescending enrolling) of your pediatrician. It’s for this reason that I choose pediatricians who are comfortable and respectful of our INFORMED CHOICE not to vaccinate our children. Informed choice…educated by the internet. Medical school does not equal WebMD. Unfortunately everyone in our country feels entitled to make what they believe are informed choices. Why even pay a doctor for his skills and knowledge then? Certainly you can figure out how to do everything he does on the internet or on a blog…nope. They are professionals for a reason. Maybe you are one too…I don’t know. But I know there are a lot of people out there who are not. And yet we all think we know everything about everything because we read 5 articles about it on the internet. I think anyone who makes $150/hour should be able to save up enough to be able to eventually go get a job he is passionate about. That’s a shame to work in a career that you don’t support. It’s also a shame that we live in a country that your choice is not really a choice. The schools, doctors, friends all assume you will get vaccinated so you have to be REALLY convinced to avoid it. As a pediatrician, I felt this had several great points. Of course, I also feel the need to comment on point 8 and the various comments from readers. As a physician who is frequently running late, I admittedly find the whole system flawed on both sides. I certainly value everyone’s time, and as a mother, I know how hard it can be to get kids out of the house. However, I also take pride in my job and vowed to provide the best care to each patient, no matter what. Though the system often “limits” the time allotted for each patient, and people are scheduled for a specific time, sick kids come in and unanticipated problems arise. As a pediatrician it is very frustrating when families show up late because it throws off the timing of everyone scheduled after them. Most of the time, I’m running late because of a patient (or several) who was late. Add in any “surprise” issue and soon the doctor is “very late”. My practice always gives the option of waiting or rescheduling, and we do our best to keep parents updated of timing, but sometimes things just go awry. Also understand that just because a doc is running late, it doesn’t mean they will rush your appointment and provide substandard care. I personally will do whatever I need to give the right care (which often means I am missing lunch). Most parents who know me understand and accept that. I feel communication with any waiting parents is key and can limit distress for everyone involved. But it also helps if everyone, both families and physicians, do their best to be early or on time. I know I rambled but this is a hot button topic in our office. I don’t usually comment on these sort of things, but I am particularly bothered by #8. This is an attitude some doctor’s have that some people’s time is not as valuable as others’ or their own. Appointments are made for a reason; to meet at a scheduled time. If the doctor is on time, but not the patient, does the patient still get to see the doctor? If it is more than about 15 minutes, then usually not. If someone is coming into the office with a particularly time consuming problem, then whoever makes the appointment for that patient needs to be clear that they need extra time from the doctor so it doesn’t push back other appointments in the day. The doctor’s office should then allow for more time in the doctor’s schedule for that patient or the doctor should consider referring the patient to a specialist who might have more time for a specific concern. If a person has a particularly urgent situation then they need to consider that they could be waiting around a long time for a doctor and should perhaps go somewhere else where they could be seen much sooner. Not to be harsh, but it really does reflect poorly on the doctor and often on the practice as a whole when a doctor (or more than one at a practice) has a reputation of being late for appointments. It is one of the attributes that people judge a good medical practice on. I am a SAHM to young children and my friends and I frequently talk about doctors. We know which ones we like and which ones to avoid and a doctor who is late can quickly get a bad reputation for that. A really good doctor (practice) would never expect a patient to still be waiting a half hour or more (certainly an hour) after their appointment time and they would work the patient in at the patient’s earliest convenience if that were to happen. I understand that doctors can be late from time to time, however, being more than 15-20 minutes late on a regular basis is just unacceptable. In the same respect, a really good parent is on time and prepared for the appointment as well, whether it be the mom or the dad. And yes, dads can be good parents, too, with respect to taking their kids to their doctor appointments! I disagree. If I have to wait a little longer to see the doctor, because he or she is attending to an emergency, I completely understand. Similarly, if it were my child in which the doctor found an unexpected abnormality which required more time, I wouldn’t want him or her to rush out at the 15 minute mark. Doctors don’t always know what is going to walk through the door, and so they can’t always predict exactly how much time each appointment will take. You should just feel happy that your child has never been sick enough to require one of those longer visits. I am an RN in a busy pediatrics office. To be truthful, the long wait is due to the need for productivity. Re: numbers. Pts are scheduled every 15 min, which is not realistic, but very very common. Just a few comments. I sometimes read comments but rarely comment of people’s comments. Now I am not a peds physician as I am family practice. A few points. I stress out about really only one thing in the office and that is running late. I hate being behind for the fact that I don’t like letting my patients wait. I do understand that people have to adjust their work schedule, take the day off, find a babysitter, etc. I respect that fact and even if they are late I will still see them (unless they are over 25 mins and I have another patient waiting to be seen me). I often work in patients on my lunch and quite often don’t get more than 5 minutes if at all to eat. I am sure that no one likes not getting a lunch, but I don’t complain because these patients need to see me. I know from experience you get less “oh by the way” things in peds as you do with adults. I will say that sometimes the reason the appointment was made by the patients is much different than what is discussed in the room. The same thing can be said that what is told to the medical assistant or nurse is different than what I hear. So when I get a visit for “med refill” this can be 1 med or 5 or even more. I know this is more of a problem with adults than kids. This does happen during peds visits as well as the parent brings a laundry list in to discuss then expects to have a well child check completed and gets mad when you tell them you don’t have the time to do all of those things. It only takes one visit/patient to throw you behind 30 mins or more. Now I take my time with my patients. I let them talk, listen and answer their questions. I am very detail oriented and I am very big on educating patients. Doing this takes more time thus the reason most of my visits are 30 mins long and not 15. (Remember again I see mostly adults). I try to not double book patients due to this. I call my patients with their labs, imaging results and other tests (whether normal or abnormal) myself due to the fact that if the patient has a question I can answer it. I try to practice and do things for patients as I feel if I was the patient what would I want. So do I complain when I am calling a worried mom or a patient at 8 pm letting them know their test results. No I don’t because I feel this is my job. Our office has Saturday hours to prevent patients having to go to the urgent care or ER. Believe me I would rather be doing other things on the weekend besides working. Every office and physician is different, but my patients love it and if needed will wait 30 mins, 45 mins or more (not always behind) because they understand the time that I am giving one patient will be the same as their appointment. If you want to be seen by a doc that is on time, quick but maybe not as thorough than that is ok. Your time is precious. It would be nice to let patients know that the physician is behind and get updated. However I don’t know if I sometimes know how long an appointment is going to take. I often walk into an appointment with the thought this should be quick and easy when in reality it took forever. I am not going to walk out of a room in a middle a visit to say can you let my next patient know I am going to be 15 minutes. I feel that I am very realistic. In whatever case the patient needs to find a provider who they feel comfortable with and can establish a good relationship with. That is my take as a physician but that is what I see and understand as a patient as well. I don’t think people go to the doctor expecting to get educated, I think they go expecting to get treatment, a diagnosis, a check-up, and so on. At least I don’t. Although I think it is good in theory to help educate patients so that they can possibly better help themselves, I don’t think it is realistic or practical to allow educating patients to take much more time than what an office visit allows. My own primary care provider (adult doctor) habitually runs VERY late and when it is my turn to see her she always takes so much time “educating” me. Last time it was how the veins work in my legs (because I was having swelling issues) and the time before that it was how the knee is constructed (because I was having long-term knee pain.) I felt like I was getting anatomy lessons and just wanted to say, “Thank you, but if I wanted to hear all of that I would have asked and I really do need to be on my way because I already spent an hour waiting to see you.” I can always look up and read about how my veins or my knees work myself. I don’t see this doctor very often so I am willing to put up with her being so late each time. I feel that doctors are paid what they are to have the knowledge that they do (they need to pay med school loans, after all) to medically treat people. I don’t feel that it needs to be the doctor’s responsibility to educate the patients. Patients need to have responsibilities for their own health, too. If there’s time in an appointment to educate and a doctor isn’t running behind, then great, but I think if they are running late, then as unfortunate as it may be, spending time on educating the patient should probably be kept to a minimum, if done at all. I think focusing less on educating the patient could reduce your stress levels and help keep you closer to being on time for your appointments. It may be kind of sad, but I think people generally value a doctor who doesn’t make them wait too long over a doctor who teaches them something about the body. Perhaps providing handouts could be a compromise. Sometimes things go in one ear and out the other anyway in the doctor’s office, especially if you aren’t feeling well. Solid points. I share others’ concerns about 5, but it’s the 3rd point that I think could be communicated better. You make a deterministic statement, A = B. If folks were to only read that, it communicates that co-sleeping is always bad. (Research in Japan and Taiwan suggests otherwise…) But in your explanation, you say that it’s actually a probabilistic relationship. Thanks for the compliment about the solid points. #3 headline is bold in its correlation, yes, but most Pediatricians are going to advise against co-sleeping, if only because the dramatically increased risk for SIDS. So the headline is devised to communicate to someone who is only reading bullet points that co-sleeping, from a Pediatrician’s point of view, should be avoided. If you’re contending that it’s okay for pediatricians to make deterministic (A always causes B) claims based on probabilistic findings from research, then I’m going to have to push back again. The studies that show the increased SIDs rates, for example, are conditional on many factors (such as smoking in the home, alcohol consumption, etc.). In fact, there are families with low risk factors that show no significant increased probabilities. Blanket recome stations fail to capture these important differences and can lead to the propagation of misinformation. There are also studies showing co-sleeping (when done safely and purposefully by a breastfeeding mother) reduces SIDS rates. The emphasis should be on educating about safe sleeping–not scaring parents about something natural that has been done safely for most of human history. Yep, Statement #3 is a problem. Anthropologically and historically speaking, co-sleeping is the norm. Baby having his/her own bedroom is a pretty recent cultural phenomenon linked to how we’re removing the “social” part from “social primates,” as well as how rich we all are. Saying it’s bad parenting to have your child snooze in physical contact with you is straight up not scientific. I also have to disagree regarding co-sleeping. It appears you’ve lumped all types of co-sleeping arrangements into the “bad” category without regard for legitimate science proving otherwise. When done safely, with the infant in a separate but close bassinet or attached crib, there are plenty of mutually beneficial aspects which make it worth considering. Co-sleeping refers to “the practice of sleeping in the same bed with one’s infant or young child”. Incorrect if done correctly Co sleeping reduces the risk of sids. My son has slept with me since birth and when he doesn’t sleep with me he has nightmares and doesn’t sleep well. Co-sleeping, when done right, is safer than putting a child to sleep in a crib ( especially if that crib is in a separate room.) Just because we can’t regulate the safety standards of co-sleeping (like banning a drop-side crib) doesn’t make the practice as a whole unsafe. How about we educate parents who choose to co-sleep rather than black-list the ptactice as a whole. Overall, there seems to be a mild increase in SIDS when co-sleeping. You can make things ssafer by not smoking, no drugs or alcohol ect, however the risk still appears at this point to be there. You’re ( or your wife ) is not wrong in this statement. Most people can’t decipher evidence and only choose to beleive the stuff that benefit them. Thanks, Craig… Appreciate the insightful comments from your experience. Parent shaming at its finest. My husband & I work both crazy hours at careers we love. Co-sleeping is, and always has been, a life saver for us. Not only does it give us sleep we need, but it’s an awesome time to steal more cuddles with the kids (I had non intention on co-sleepIng before having our first, who was a terrible sleeper). It may not for everyone, but please don’t be so dramatic as to put it on a list that includes TV and, gasp, juice. Also, the whole “incompetent dad” bit? Stop. Just stop. Thank you! Co-sleeping is the ONLY way I get to sleep as a breast-feeding mother. Plus, out of all my friends, I would say my kids sleep the best (fall asleep quickly with no anxiety and no nightmares). Co-sleeping may not be the Western norm, but it is the worldwide norm. Number 5 bothers me. My husband nor I have ever missed one of our childrens Drs appts. We both are well aware of anything that could be asked about our children even though I am a SAHM and he works 80+ hrs a week. If he can keep up with what is going on at home anyone can. Anyone who doesn’t know those things about their children should reconsider their priorities. As for number 8, that is a cop out. Don’t schedule 3 appts for the same time slot and you won’t be late. Our time is just as valuble as yours. Re: Juice. I’m not buying it totally. I want to see the research…correlational or causal? What variables were controlled? Any controls put on the endocrine disrupters that regularly leach from common juice containers? Family life style and diet? Also, a renowned pediatric nutritionist, Ellen Satterly, has studied children’s eating habits extensively and found that children who were allowed regular, time-limited, access to sweet foods were less likely to become obese. She found that these kids were more likely to have natural instincts about their limits for sugar as opposed to kids that were not allowed to explore for themselves. So, not completely sold on that one at all. I’m also not buying the co-sleeping argument, based solely on personal experience. No one in our house would sleep at all if we weren’t co-sleeping. And this from someone who was firmly opposed to it pre-baby. I’m a pediatrician. I agree with most of this with one exception…number 2. Fever is safe in most kids except the Unvaccinated ones. I want to see them in clinic for fevers >102. The risk of meningitis is still very real for these kids. Sad to see because vaccines work so well. Item #5 is poorly delivered, if true…and I’m not convinced that it is. As a father of two newborns that were in the NICU, I was involved as I could be (and still am), while still working 40+ hours/week. I remember coming into the the unit one evening and having the nurse residing over our twins quiz me about their feedings and medication, which mind you was an ever-changing thing. I’m their father, not their physician. That’s what I’m paying you and the hospital for. Review their chart and medical history. Then talk to me about questions you have or what I need to understand as a parent. I’m not sure this post is as informative as it may claim to be; seems more aimed at “parent-shaming” than anything else. What if it was me back there and during my routine check up they found something abnormal. Oops! Your time is up. Guess we’ll have to discuss that in a week when we can get you back in! Then I’m OK with them running late. yes, this happens more often than you may think. medical/dental offices are NOT places where it is always possible to know in advance what you are dealing with, the child with suicidal thoughts probably did not call in & mention it requesting an extra hour or 2 of time. thanks for understanding we deal with real people, real problems and they never run on a perfect schedule. Ya know, I think most people understand that doctors have important things that can come up. (Though I’m sure they are also just human and sometimes just got behind for more mundane reasons as well) Regardless of the reasons for being late and keeping people waiting, I think the real problem is often more of customers service, or lack of. As soon as a problem is known and the doctor’s schedule is very delayed, more that 15 min (just like docs give patients running late before making us reschedule or having to re-fit us back into the schedule) the waiting patients should be told the doctor is running behind, about how much behind, and those patients given the option to reschedule if they need to. Instead waiting patients are often left to just wonder and be annoyed or the staff just acts annoyed when we ask “how much longer?”. This is a fairly common issue, especially in the pediatricians office it seems like, and better communication and an openness to allowing the patient to reschedule if they need tocould go a long way to less disgruntled patients. Yes, this. Thanks for saying so succinctly and on point. Number 8 really grates on me. I am so careful to show up early to our appointments and Not Once have we been seen on time. Read that again, not once in 7 years, between numerous doctors in 5 different states. Which means there is a serious problem in staffing and availability that the AMA and doctors should be discussing. There is no point telling patients, who pay for your services and take vacation time to do it, that we are the problem. As a husband of a physician I can tell you it bothers them as well. The issue is not solely the doctor but an issue that starts with insurance companies. They force visits toto fit in small time slots, based on what they consider to be severity of the issue. Even though that time is not adequate that is all they would on compensate for this time slots. The doctors office then books for that time period according to the insurance company and even though it is not adequate the doctors try to make it work. The office is motivated by profit margins (which is slim in primary care per patient). While the doctor is in the room they must make a judgement call rush the patient or address their issues. The end result is they run behind. I hear them talk about it all the time, but no change. Side note if they hear suicide (as the example presented) they are obligated by law to work through it they cannot leave and walk out. You can ask the office to call you if the doctor is running behind. Please do not blame insurance companies for a physician running behind on their schedule. Most physician groups are owned by corporate systems which place demands on physicians to see a certain number of patients per day, which is unfair to the physician as a professional and the patient (and people accompanying the patient). It is about the group’s profitability, plain and simple and both the physician and the patient are caught in the middle. Patient shouldn’t have to ask if the doctor is running late, the staff should keep the patient appraised. How can a doctor be late for 1st appointment of the day? Does he/she have the same obstructions getting to the office for which the patient is to be rescheduled? If a patient has multiple concerns that will require more than the allotted time ask that patient to return later in the day instead of adversely affecting every scheduled patient! Any black moms, dads, kids, or doctors involved? Most of the points are obvious, but #5 is seriously uninformed and degrading towards fathers. Generally the person going to the doctor with the kid needs to be informed no matter if it is the mother, the father, or the grandparents! Point 5 is true, however the second portion of your comment is a great point and I have re-edited along those lines. You did alter some wording, but the title and Gif are demeaning, and very un-necessarily so. You seem keen on “Daddy Doesn’t Know.” But that is BS. Knowledgeable, involved dads are the norm, not the exception. “Be Up to Date” “Be Informed” “Be Prepared to Answer Questions” all get to your meaning without taking a pot-shot at fathers. i just dropped my newborn on my cellphone!!! I am a doctor and a parent. I agree with these, but want to add to the “be patient” part. As a parent who is very busy, it drives me nuts when the doctor is more than 15 min late and nobody has stopped by to give us an update on the timeline. As a doctor, I understand the type of stuff that comes up to delay the appointment, but it is inconsiderate of the patient if the staff doesn’t check in every 15 min with an updated timeline. Can we retire the “bumbling Dad” stereotype already? It makes me angry [and I’m a Mom!]. How can we expect Dads to be involved in their children’s lives when we are constantly putting them down? But If you can’t answer these questions with some detail, it’s probably best for everyone if you become informed about your child’s health and well-being. Addressed and re-worded. Thanks for feedback. And yet still demeaning and poorly written. And yet it’s still titled “Dad doesn’t know” coupled with the video of a bumbling oaf-like father dropping his phone on his 3-minute-old infant’s face. I’m so sick of this stereotype. Leave the gender COMPLETELY OUT and just say something like “be prepared with all the relevant information when you visit your pediatrician.” Just sticking in “— mom or dad —” as an aside or afterthought is insufficient. hi, I would like to know if in number 1 you refer to boxed juices or you also mean made at home juices. I never give my son the first but always make home made fruit juices (orange, tangerine, apple. pineapple, etc) for him. Wife says eat the fruit, it’s better. Juice is empty calories. When drinking juice you get all of the calories and sugar from the fruit without any of the fiber. Pure sugar spikes insulin levels creating a drop in blood sugar after a short period of time. This “low” makes the body send out hunger signals. Concentrated sugars, made at home or out of a box, aren’t the best option. But I would also say if someone loves juices homemade is better than boxed as long as the fruit the juice is made from is quality organic fruit. Agree with both Michael & Jeremy but would add that fiber is key. To avoid the insulin spike & subsequent dip with fructose, include the fiber inherent in eating the whole fruit as it will slow the body’s processing of the food and even out the release of insulin. If you’re blending whole fruit into a smoothie, it’s essentially the same as eating the fruit. If you’re juicing or squeezing, you’re omitting the fiber and, as Michael says, the fruit would be better. I disagree with #8 the most. I’m sorry but most parents done have a couple hours to wait around for a doctor who can’t properly schedule their patients. Most people have to use their lunch hour, PTO, sick time or unpaid time. Running a few to half hr is one thing but to expect a parent to wait around a couple hrs with a kid (who could be missing school too) is unacceptable. Appointments are for a specific time. I expect to be seeing close to that or told when I check in the dr is running late and given the option of rescheduling or seeing someone else. If you need to cram patients in that much chances are your not spending much time with them anyways. I agree w you. The additional issue I have with this is that they expect me to be on time but then also expect me to accept them being late. I was about 5 minutes late to a doctor appointment w my son who had been sick for too long w no improvement…my daughter was in a mood and not letting me leave at the proper time and my son wasn’t moving real fast. The receptionist actually told me they may have to reschedule because we were “so late”. Of course by the time I talked to her it was closer to 10 minutes in because she was on the phone when we got there. Not her fault by any means but to tell me my sick kid has to wait to be seen because this 1 time we were late really bugged me. I think it is rare that the Dr. is an hour late (in my experience anyway). I also have felt that when this happens it is for the reason that someone else’s needs are greater than mine, and I appreciate that the Dr. is taking the time out to spend with the patient that I know she would spend with me if my needs were greater. It is hard to wait with a sick or cranky child, but sometimes the staff can be helpful in offering an extra book, toy, or cup for the fountain. The tv in the room issue is an important one. I have always preached this. My husband grew up with a tv in his room and thinks I’m a bit mean. My saying is “As long as there are books in the world, there will never be a tv in your room.” There are plenty of opportunities for tv watching, and the bedroom doesn’t need to be used for that. Maybe #5 could have avoided all the controversy by simply stating that the caregiver with the most knowledge of the child’s health information should be bringing him to the Pediatrician. In my house there is an imbalance, having nothing to do with anyone’s incompetence. I totally agree!!! Especially since we’ve been 10 mins late to ours before and they’ve made us reschedule. If we can’t be 10 mins late due to an unforeseen circumstance, why can they be 2+ hours behind? As to the doctor running late issue – First – I get that important things might come up and the doctor is running late. I get that and I think most people do. However, if I’m going to have to wait a really long time past my schedule appointment then give me the opportunity to reschedule. The communication is too often really bad to the waiting patients. A little more communication about what is going on and how long the wait is estimated to be, with an apology and the option to reschedule if we need to would go a long way to better customer service. We are ALL busy and have many obligations on our time, not just doctors. Everyone. Besides, a lot of doctors these days threaten to reschedule you if you are more than a certain amount late, usually 10 or 15 min, and still charge a co-pay fee. Fair is fair – I’ll be on time and if for some unforeseen reason I can’t be on time, I’ll let you know as soon as I know and I’ll be open to rescheduling if that works better for your schedule that day. Doctor, you do the same, ok? Ok.
Good article but I will have to respectfully disagree wholeheartedly with #5. I am also a spouse of a physician and am always informed about what is going on with my children. To that end, I left my career three years ago to raise our two kids, and have found being a stay-at-home dad (SAHD) to be the most difficult and rewarding job I have ever had. While SAHDs are not the majority, involved dads are more the norm than the exception in today’s world. We also happen to live in a world with EHR and other knowledge, even about our children, at our finger tips. I would be sad to learn that your wife really sees dads in this way at her medical practice. I am proud to say I know more than a few pediatricians that also disagree with only that item of your article. Regarding topic #5. True or not true, there is a tactful way to present a case and a demeaning way to do it. The video delivers shows a bumbling dad. As a man, I try not to glorify is the weak moments that I see in women. I would ask the same kindness in return. Thanks for the kind words. Article clearly states that are many dads like yourself who are exceptions. However in regards to this it has been subsequently edited to emphasize that both parents should be up-to-speed, whoever is taking child to well visit. Thanks for feedback. 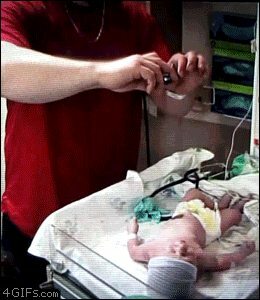 I appreciate most of your ideas, however the continuously looping video of the dad dropping his cell phone on the newborn does not translate fairness and, although I can find the humor, it’s still disturbing to watch. Sure the content may *somewhat* talk about both parents being up-to-speed, but both the title and image (the 2 most in-your-face components of that section) clearly point the finger at dad. “If you’re a father who is a primary caregiver, or equally and actively involved in your family’s child-rearing, you are probably up to speed on the finer details of your kids’ health history.” First sentence in that paragraph. What exactly are you disagreeing with??? The article is talking about the fathers that are NOT actively involved in the child’s care.